From hardscrabble East Texas to the gothic deceptions of a Corn-Belt prep school, Colleen Powderly's poetic memoir is a riveting, sometimes harrowing, read. As well as a tale of hard-won survival, this is also a narrative about a young woman's awakening to language and the possibility of writing as redemption. Counterpointing the poems that carry the narrative are others that tell a ghost tale, as well as image-laden lyric offerings, and a couple of delightful and surprising language experiments. Colleen Powderly has given us a remarkably courageous, well-wrought, and intensely moving book. When is best to pretend or not to pretend-to disappear and hide and reappear when the time is right? Is this how a female personality splits into many personas to survive what she can and cannot control in her life? How does this woman's psyche heal after it has been split? Colleen Powderly's lyric-narratives take a hard look at violence against women, creating a map that moves from East Texas to New York to the Midwest. Her first-person narrator speaks intimately as a voice for all abused women, showing us incidents from childhood and adulthood that become a haunting history revealed in its “under-telling”-things uncovered just beneath the surface-unspoken things, now said. 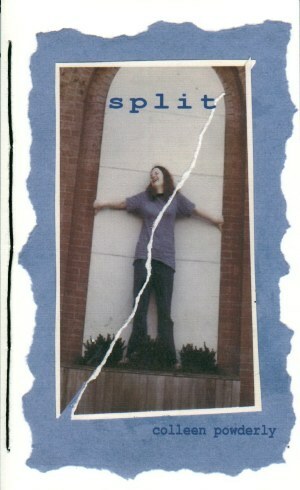 Split is a taut and powerful collection: poems of extraordinary grace and unparalleled courage: a woman hammering out from the dross of adversity the silver of survival. Keep your eye on Powderly: a poet to be reckoned with …. In Split, Colleen Powderly mines her past for shards of memory and discovers a gold mine. These are poems of witness, written from a life of experience and regret. I had missed what love meant, she writes in Epilogue, but that's not quite true. In going back, Powderly misses nothing. In Split, Colleen Powderly gives us insistent, urgent work, poems whose messages are conveyed through the bewildered, wounded heart of a child. Over and over, we see the child trying to figure things out on her own, and we hear the adult she became letting her know it's OK to talk about it all now. Ms. Powderly's poems have a certain calm despite their themes of violence, injury and abandonment, a calm which allows the reader to bear the journey and arrive, with the poet, in astonishment at the power of language to illuminate, validate, and heal. and wonder how much it can be blamed. Perhaps the Fates control us after all. in the silken thread and I write this poem. May no one disturb her. They leave me writing, given grace to tell one truth. They cast me this lot, and I will honor them. in his Easter basket the previous spring. a blind date to a movie. What did we see? where water sparkled darker than my dress. and lingered until he somehow seemed too near. Colleen Powderly's earliest memories come from small towns in southeast Texas. By the time she was 12, her family had moved to Rochester, New York, where she graduated from high school before attending college in Missouri. She remained in the Midwest until 1980, when she returned to Rochester to work at a variety of service and social work jobs. She has worked for twenty years as a counselor, and now works in a maximum security prison as a drug and alcohol counselor. In 1997 Colleen began writing poetry. In 2006 she attended a workshop by Carolyn Forche and became inspired to finish poems begun nine years earlier, about family events from the deep South and New York, as well as trauma from her first days in college. This sequence, intended as an act of witness, has become her first chapbook, Split. Colleen's work has previously appeared in several journals including Palo Alto Review, The Alembic, RiverSedge, The HazMat Review, and Fox Cry Review, as well as in Knocking on the Silence: An Anthology of Poetry of the Finger Lakes. is a 44 page hand-stitched paper book w/spine.